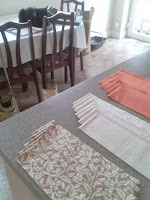 I've made a start on cutting my brand new fabric for Eleanor's Quilt. It is just the most exciting thing - but scary too! I've checked and double checked the cutting list, and these are the strips ready for cross cutting. However much fun it would be to carry on with the next bit, I know that it is MUCH MORE SENSIBLE to do this in stages, so that the ol' grey matter is in tip top order. I'm much likely to make a good job of not just cutting, but piecing too when I'm fresh, and the 'oh, that'll do' shoddy bits are always when I'm impatient and tired at the end of a session. Half an hour cutting, and that's enough for the time being. Cross cutting will be later after I've gone to visit Grumpy George at the allotment. He'll point out courgettes (zucchini), runner beans, french beans and raspberries for picking, I'm sure. Oh - and Oliver cat says that in the meantime, he'll make sure that no one steals the fabric. Well done, Oliver, thank you. Sensible method - keep it fresh. My kitties love to nestle down onto freshly cut fabrics, too. That's a very good idea, especially with the cutting bit. A sewing mistake can be unsewn, but a cutting error can be a disaster. Aren't cats so funny with fabric. I used to have 2, and one played with it and one sat on it. I do miss not having any pets. Maybe a dog soon, so I go walking more often. 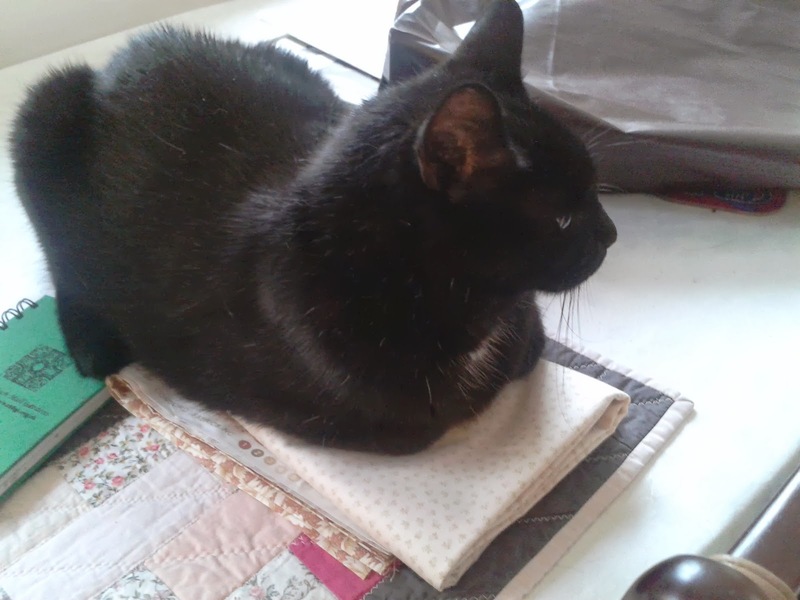 I think you're right, Sue - I am only cutting the fabric for the blocks, but even so I am being VERY CAREFUL. I think that pets add an extra dimension to life - not just for exercise & companionship. Something to reflect on for when you move, maybe. Always a good idea to take your time! Enjoy visiting George...though I hear there are now two special George's over there! I agree, cutting is best done when you're all bright-eyed and bushy-tailed.